You have set an amazing example and I hope others follow it. Thank you for everything you have done, all I wish and hope for is for a world with more people like you. Words cannot express the true lose of your Mother. Not only to The Elephants that touched her soul, but ours as well. With a heavy heart I write this to you to let you know how she opened my eyes to the wonders and Love of this beautiful Animal. Just watched a documentary on conservation and googled her. Certainly one of the genuinely great people of our generation. I think the AU needs to institute an award to honour them. May God grant her a peaceful repose. Amen. I have no personal account, but just finished reading the memoir “An African Love Story”, which is one of the most compelling books I have ever read. What a life, what a phenomenal achievement and what deep insight into wildlife and particularly elephants and their behaviour. I can not begin to imagine the emotional turmoil of rearing elephant orphans and am just stunned at her determination to always look forward. It almost broke my heart to read the book, but I am thankful that I did and I truly hope that Dame Daphne Sheldrick’s work and the work of the foundation will make an even bigger difference in the future and will contribute to a healthy, solid and growing elephant population in the years to come. I hope to be able to visit the orphanage sometime in the future. When I first read the news of Daphne’s passing, I cried. The loss was felt deeply, even from half a world away. I was filled with grief for a woman I’d never met, but respected and even envied for several years. Such was her gift to the planet. I’m a foster mum to 4 baby elephants, along with Maxwell and Kiko. Wendi was the first baby my husband fostered in my name, as a Christmas gift. It was my first window into the Trust. I was hooked from that point on. With my first foster email, I discovered the icon that was Daphne. I read her own words, and those about her from others and I loved her immediately. Full of compassion for all the creatures on the planet, and her tireless work for not only elephants, but all animals, she earned my utmost respect and admiration. I wanted to be her! Her passing was mourned globally, as she was such a great steward of the earth and its creatures. She will be missed terribly, but the legacy she leaves behind in Angela, is a credit to her as a mother and a human being. I’m so sorry for the loss of those who knew her personally, and loved her. So many people grieve her loss. One great legacy she leaves us with is her replacement. If anyone can fill those amazing shoes, it’s Angela. Rest in peace Dame Daphne. You will be remembered always. I am truly touched by everything that people do to protect our nature. This amazing Woman did so much, such an angel. I wish I could do that much as well, but right now I’m passionate about cleaning forests from plastic bottles. Guess some help is still help. Sheldrick family and co, please keep up your amazing work. This world of ours needs more bright individuals willing to protect Earth just like Daphne was! I love elephants, they are so intelligent and kind. Much love to the entire Sheldrick family and everyone who works with them and helps! May you rest in peace, a truly amazing human being Daphne Sheldrick. What a person gives to the good in the world, is not lost. Simply….”Thank You” Dame Daphne Sheldrick for all that you did. May you rest in peace. Saw the wonderful documentary ‘the elephant who found a Mom’ today And googled ‘Daphne Sheldrick’ to find out more about her Life. She led a wonderful life and left a Great legacy. My condolences to Angela and all her family. I am very sad. I’m sure she will continue her work wherever she is now. A hug. My heart is broken to hear such a wonderful women has passed. I wanted to meet her since hearing of her two years ago. I know that all her life dedications will continue to give forever. I hope to be someone like her in this life. We need people with a love of God’s creation such as she had. May you rest in heavenly peace sweet lady. You will always remembered. Was very sad to hear of her passing. Will be missed. All the updates with her talking about the babies. My condolences. Dame Sheldrick was, and will continue to be, my “rock hero”. I am grateful for those who will carry on this amazing work. The world will miss her. There are no words to adequately and eloquently express my gratitude and appreciation for all that Dame Daphne has done for elephants and so many other wild animals, as well as for the humans who care about their plight, or who have learned to care, because of her tireless and selfless efforts. What an incredible legacy to leave to one’s children, family and extended family, both two- and four-legged. Thank you, Dame Daphne, for being the champion not only for those in your care, and still fighting to exist in the wild, but also for your commitment to education, so it may continue and never be in vain. I can only imagine the ‘welcoming committee’ you had upon your arrival in your new resting place….may you rest in peace! A great soul has passed from the Earth. My profound sympathies to all of the Sheldrick family, to direct relatives and to all who were included in the great orbit of Daphne Sheldrick’s caring and love. If we are to honor her memory, I feel that we must carry on the tradition of a compassion towards all living beings, and drive forward with the mission of conserving the wilderness and wild animals that remain to us. 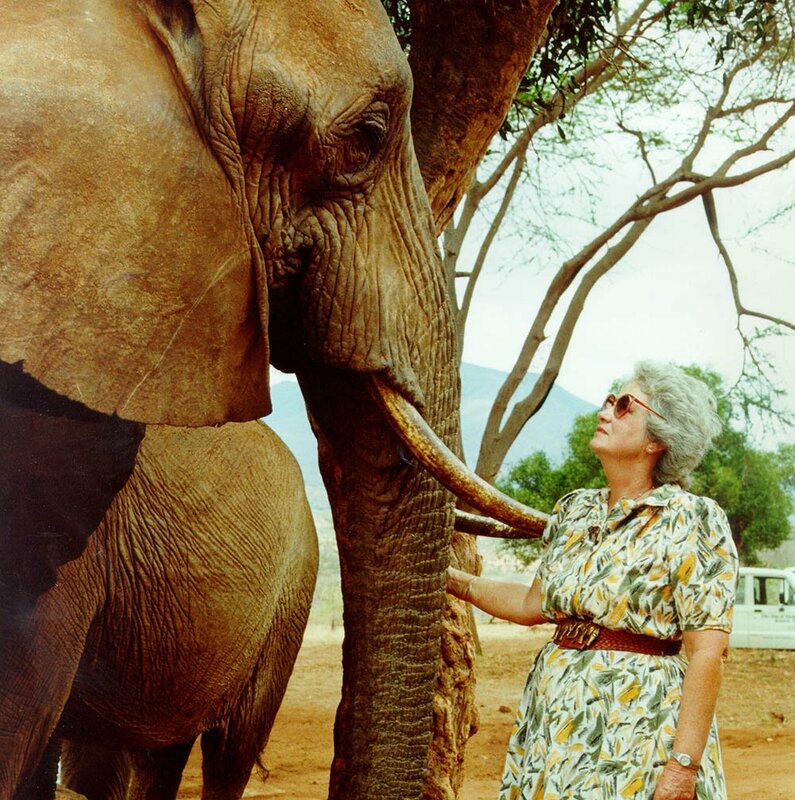 Thank you, Dame Daphne, for showing us the way..
Dame Sheldrick was truly an amazing person with a heart that was so big that is had room for her human family and also for many elephants and other animals. She is an excellent role model and touch many during her lifetime. I first heard of Daphne Shldrick when i saw a NatGeo special on tv called “Daphne and Eleanor” years ago. That show really touched me, especially the fact that she found a way to release the orphaned elephant babies back into the wild sucessfully-via Eleanor. I followed Daphne’s work for years, and fostered many orphans myself, then had the great honor of meeting her in 2014 at the Kenya location. I had sprained my ankle while of safari in Tanzania, but wasnt about to miss the opportunity to meet her- so, hobbling on one foot, i made it to Kenya dn the orphanage. It was truly the highlight of my trip. I now foster elephant or rhino orphans for my nieces and nephews every year, and will do so for all my grandchildren too when they reach school age. her book “Love, Life and Elephants” was a wonderful story of her life, and a must read for anyone who appreciates her work. Thank you Angela, for continuing her work. She will always be a hero to me.